Next, we go from one of the last Hawkeye Olympic medalists to the one of the first. George Baird secured a medal for the Hawkeyes way back in 1928. George Baird was born in Grand Island, Nebraska, on March 5, 1907. His father was a chemist and superintendent of several Midwest sugar beet factories. Baird relocated to Mason City as a youth and attended Mason City High School, where he became a rising track star. At just 5’9″ and weighing 145 pounds, the slender George Baird enrolled at the University of Iowa in 1925. Baird won six Big Ten championships in three seasons with the Hawkeye track team. As a junior in 1928, he placed fourth at the NCAA championships in the 440-yard dash. One month later, he entered the U.S. Olympic Trials in Philadelphia. Baird came up short in the 400-meter final, but he won a runoff against two opponents to qualify for the U.S. 4×400 meter relay team. Baird traveled to Amsterdam for the 1928 Olympics, where the 4×400 meter relay was the final event of the Games. One week earlier, Frank Cuhel had earned a silver medal in the 400 hurdles, becoming the first Hawkeye to earn an Olympic medal. Now Baird had an opportunity to become the second Hawkeye to medal in as many weeks. George Baird was scheduled to run the first leg of the 4×400 meter relay, and he shot out to a three-meter lead ahead of the field before handing off to his teammates Bud Spencer, Fred Alderman, and Ray Barbuti. Baird’s three teammates finished the race in style, not only winning the gold medal but shattering the previous world record. On the final day of the 1928 Olympics, George Baird had become the first Hawkeye athlete to capture a gold medal. The four Americans actually broke their own world record a week later at a meet in London. 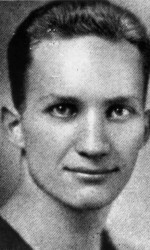 Baird soon returned to the States and graduated from the University of Iowa in 1929. He wound up working several odd jobs through the Depression and World War II, and for several years, he worked with his brother Bil Baird, a world-famous puppeteer. But in 1964 he earned a masters’ degree from NYU and eventually became an assistant professor of education there. George Baird lived a long, successful life. He was interviewed for a segment on NBC’s Olympic coverage during the 2000 Olympic Games in Sydney, when Baird was 93 years old. The former Hawkeye passed away in 2004 at the age of 97; at the time of his death, he had been the oldest surviving Olympic gold medalist. George Baird lived over 75 years after his gold medal performance, a performance that forever secured him a place in Hawkeye lore.